Aikido was founded by O'Sensei Morihei Ueshiba who was born in Tanabe, Kii Province (now known as Wakayama Prefecture), in December 14, 1883 . He developed and synthesized aikido from various other martial arts which he learned as a young man. His practical experience in this arts is one of the richest and most thorough of any sensei (teacher). Many of the arts and techniques which are found in aikido date back, in fact, more than 700 years to the time of the Genji and Heike regimes. 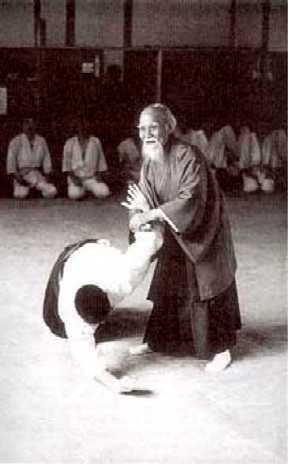 A number of the masters under whom O'Sensei Ueshiba studied died without revealing their arts to any other disciple. He also pursued religious and philosophical studies: Zen, under Priest Mitsujo Fujimoto of the Shingon, School of Buddhism at the Jizo-ji (1890-1893). In later years (1918-1926), he became deeply involved with the religious school of Omoto-kyo, founded by the Rev. Onisaburo Deguchi to the entent of participating actively in the promotion of of the sect in Korea, China, and Manchuria. O'Sensei Ueshiba himself marks 1925 as the year in which his thus far unsatisfied search for a deeper meaning to attributed to the martial arts came to an end, or rather to the treshold of a new dimension which was to be explored further by him and by his followers. It was in this year that he succeded in blending the highest ethics of mankind with the practice of the martial arts: he developed that practice into a particular, truly defensive art in accordance with the highest dictates of those ethics. In 1927, his dojo (practice hall), was moved to metropolitan Tokyo. His method aroused interest in highest circles. He taught until World War II emptied his dojo of its most promising pupils. There was a temporary ban on any instruction in military arts (1945), but with renewed stability Japan once more assumed a position of prominence in Asia and in the community of nations, and this ban was lifted. Since then, aikido has expanded until today it is being taught all over the world.